“With gas becoming increasingly constrained and expensive to produce throughout the Gulf region, governments and national oil companies must consider steam generation for enhanced oil recovery (EOR), said an industry expert. “The economics of steam generation hinge on the cost of the fuel source. Most Gulf countries are facing gas supply shortages, yet have high fuel subsidies that alter the retail price of gas—often to a fraction of the production cost of complex, non-associated gas,” said Justin Dargin, University of Oxford Middle East energy expert. He was commenting on the recently released Society of Petroleum Engineers (SPE) paper entitled, “Economics of Steam Generation for Thermal EOR” released by GlassPoint Solar, a leader in solar EOR. The SPE paper examines the economics of generating steam for thermal EOR using three methods deployed at oilfields in the Gulf region. Findings show under what conditions solar steam generators deliver the lowest-cost steam compared to steam produced from fuel-fired alternatives. “To fully understand the economics of generating steam, we must look at the marginal fuel value, which for some countries in the Gulf can be the price of imported LNG, diesel or other liquid fuels. These countries may pay more than $13 per MMBtu (million metric British thermal units) for fuel needed to meet future demand for thermal EOR, industrial development and power generation,” said Dargin. The paper presents detailed performance and economic models for solar steam generators, gas-fired once-through steam generators (OTSG) and cogeneration using waste heat from a power plant to fuel a once-through heat recovery steam generator (OT-HRSG). Using $13 per MMBtu as the marginal fuel cost and $6 per MMBtu as a representative domestic production cost of gas in the Gulf, the models were used to calculate the Levelized Cost of Energy (LCOE) and the Fuel Break Even (FBE) price for each of the methods. Milton Venetos, a specialist in thermodynamics and modelling, explained that economic and environmental burdens must be applied to fuel-fired steam generators to account for true macro-economic implications and create a fair comparison base. “Many believe waste heat from a power plant is free, and therefore the steam it produces is also free. In reality, producing steam from cogeneration is dependent on the price of natural gas, since the waste heat could be used to produce more power or to desalinate water without consuming additional fuel,” said Venetos. 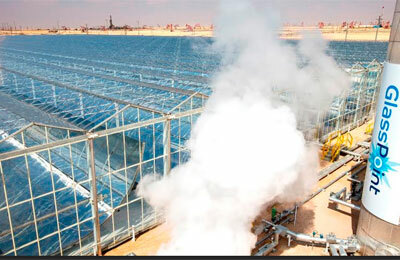 Findings concluded that at a fuel price of $6 per MMBtu, solar steam generators produce the lowest cost steam at $17 per ton of steam, compared to $20 per ton from cogeneration using a fully burdened OT-HRSG and $27 per ton for an environmentally burdened gas-fired OTSG.